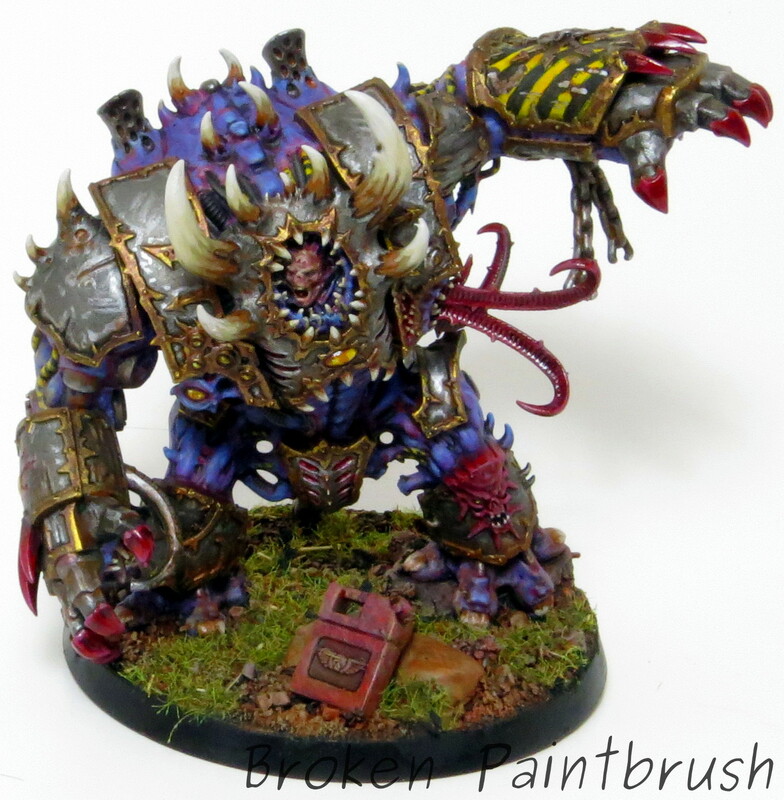 So to break up the aliens a bit, I got a bit excited that the Helbrute kit finally came out for Chaos. 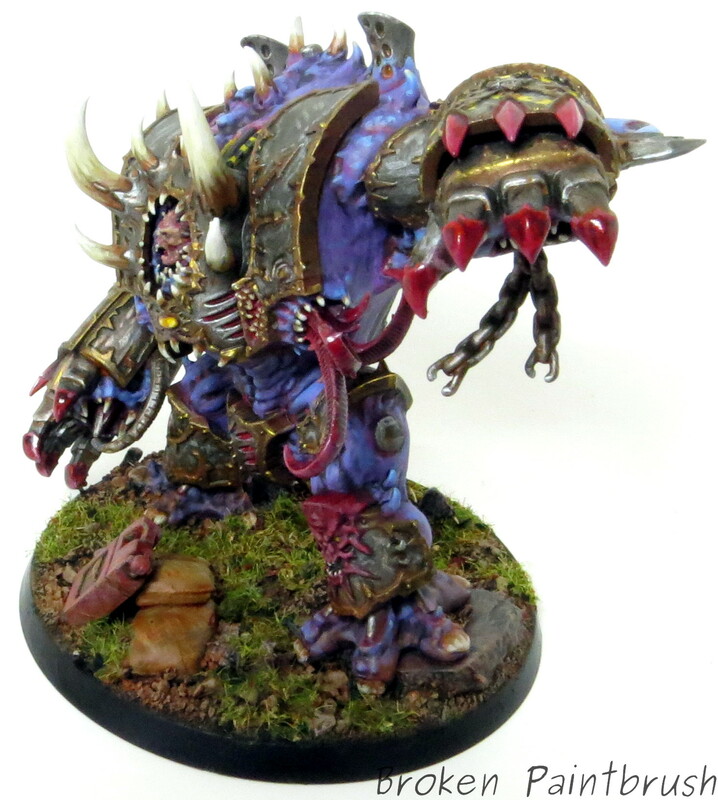 I had been holding on to the Dark Vengeance model – which I think is a fantastic model (especially for a starter kit!) but I was waiting for a multi-part kit to customize it. For me the stubby Multi-Melta looked a bit off, so that’s what I fixed! To contrast the silver and yellows of my Iron Warriors, I figured purple would do just nicely so I went with purple-blue skin and red-purple red accents. 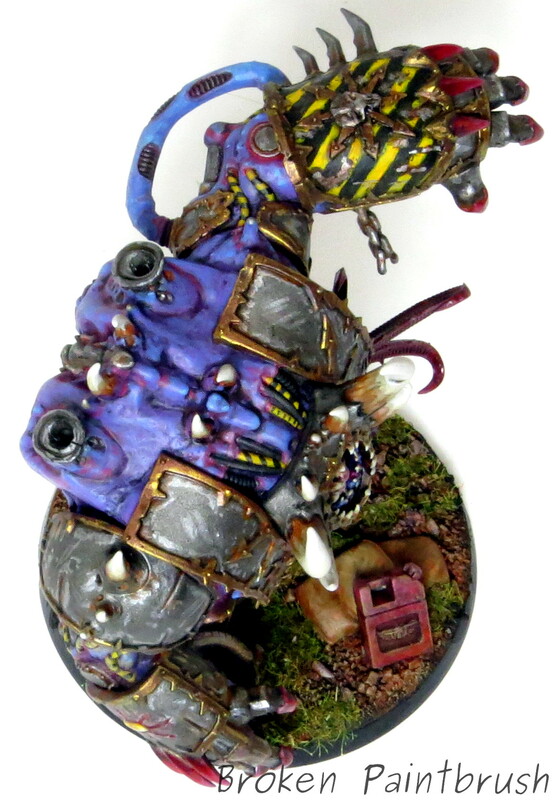 The skin is worked up from Xereus Purple to Calgar blue (with some Lothern blue on the tubing). 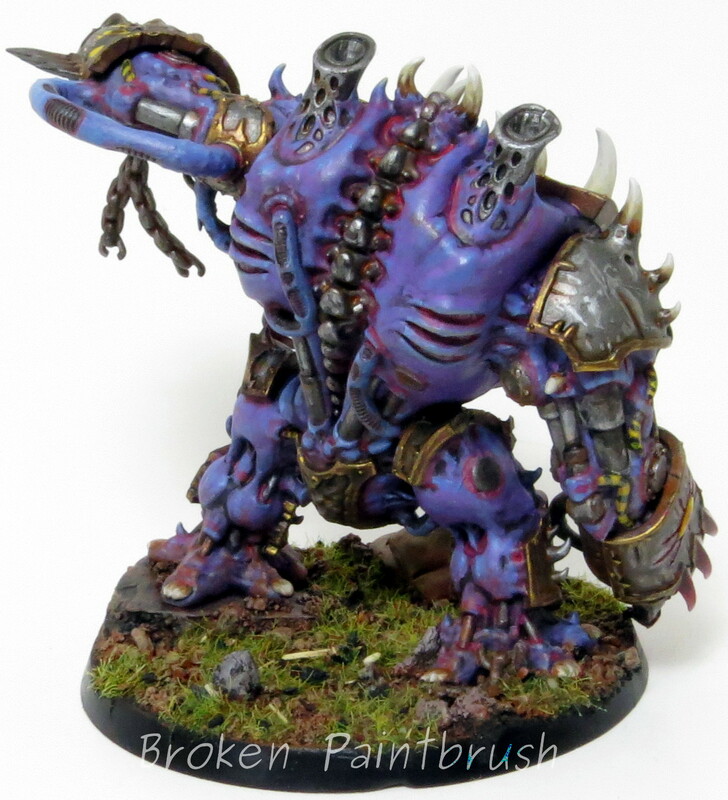 I used washes of Khorne Red, Leviathan Purple, and Earthshade to add the bruising and shadows. 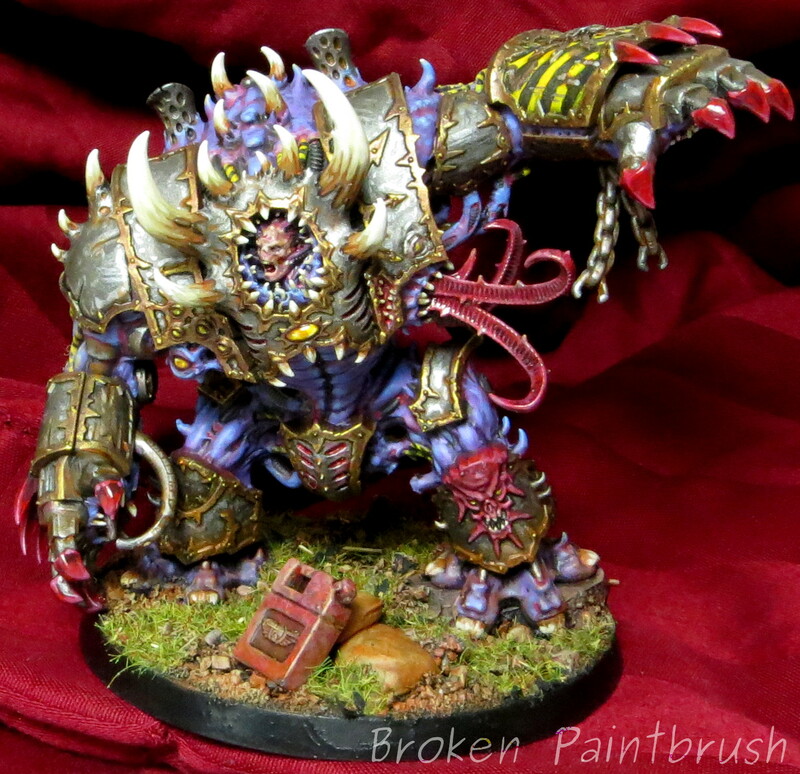 The red was built up over a few shades of red and purple wash used on the daemon face and tentacles. Hard coat was later added to the claws to make them blood-glossy. From the top you can see the nice contrast between purple flesh, hard metal, and the yellow stripes. The Iron Warriors skull on the hand was an attempt at sculpting a custom badge. I carefully scrapped off the eye that was there and built up the skull shape with greenstuff. Here is the action shot! I choose the new right arm to make him look like he was shoulder checking with a massive left hook coming after. Final parting shot, decided to try a colored background ala GW style (all red and hip). It does help the horns stand out a bit more. 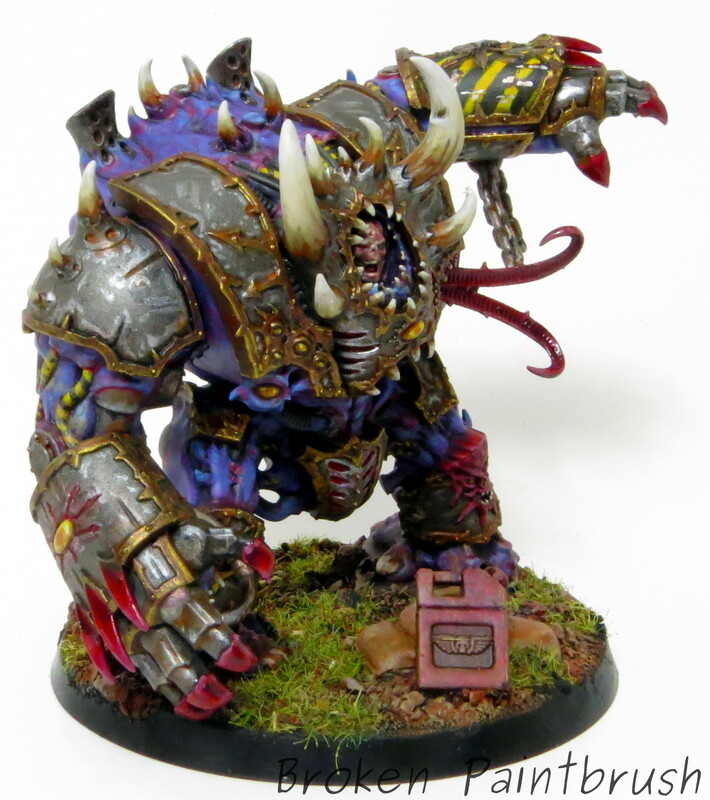 Somewhere in the queue is the actual Helbrute from the new kit as well as a kit bashed version use the old metal dread! Both are based coated and just waiting all the yummy details.